Who do 'free' financial planners really help - you or banks? CONFLICTS of interest are rife in the wealth management sector and no financial advice is ever "free", according former Lismore councillor and finance journalist, David Tomlinson. Mr Tomlinson fleshed out the issue following news that Lismore legal firm Somerville Laundry Lomax was taking inquiries from clients burnt by bad financial advice. He explained that the problem began when the big four banks bought up of most of Australia's independent financial advisers following the introduction of compulsory superannuation in 1991. "It was a paradigm shift because up until that time it was only wealthy people who sought financial advice. "The superannuation system was so complex that everyday people needed instruction on how to organise their affairs. In fact the planners were seen as product distributors, which is why they (the banks) bought them all up. They're job was to sell, sell, sell, and that's what they did. "There was a huge growth in the wealth management industry; a whole proliferation of products emerged. "All the banks and insurance companies developed products that could be sold to people with superannuation; share market trusts, property trusts, fixed interest trusts buying government bonds. "The problem is that banks needed to sell these products to investors, and they saw the financial planners as the best way to sell the product. "In fact the planners were seen as product distributors, which is why they (the banks) bought them all up. "They're job was to sell, sell, sell, and that's what they did. "The other problem was many of the planners operated on commission, which means they would get commission from the owner of that product - the banks." And therein lay the conflict of interest. Financial advisers were presented as independent, but in reality they were mostly not. People who go to a financial planner expect the planner to advise them what's in their best interest, not the planner's or the bank's best interest." High commissions on offer by the banks sometimes encouraged planners to put people into high-risk investments, telling their clients they weren't risky, but when the investment went bad - clients were sometimes left broke. "When you go to a car dealer you expect them to sell you a certain type of car, but when you go to a financial adviser you expect independent advice - but that's not what you're getting." The Commonwealth Bank has been put under the spotlight over the issue recently with the conduct of "rogue" employees causing the loss of life savings, for some. Mr Tomlinson also said while the former Labor Government introduced legislation banning commissions, the Coalition plans to wind some of the measures back. Mr Tomlinson said people thinking of investing their money should be "extremely careful" of anyone offering "free" financial advice. Seriously, who needs life insurance? 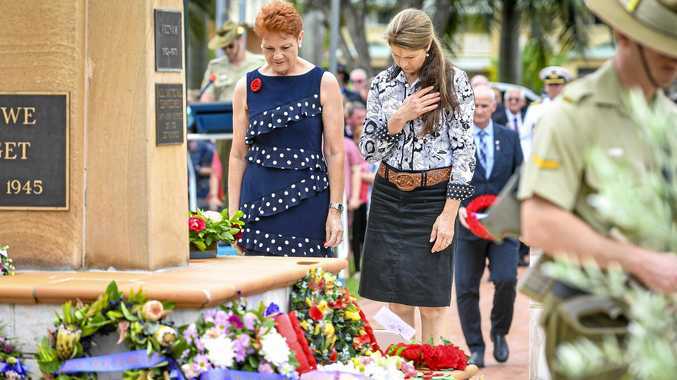 Politics ONE Nation leader Pauline Hanson chose Gladstone to pay her respects on Anzac Day. Politics LNP unleashes campaign against Labor's climate policy. News Hayley Beaumont shares Anzac Day message from abroad.